Howdy folks! With some well deserved relief from the heat and much needed rain on the way, things couldn’t be looking better on the local fishing scene. Many Otter tribs started the day in the low 60’s, but are still low and clear. The Otter itself was still a touch over 70 early this morning in the Middlebury area, but I found some mid 60’s further south on the Otter. Some Iso’s, and a few caddis were around. Fish seemed to like the standard Iron Lotus, rainbow warriors, and frenchies. Pretty much what has been producing fish for people the last few weeks. The upcoming rain, if it amounts to what’s scheduled should do a couple things for local waters. First, it should cool them down a bit more and more importantly cause the trout to feed heavily! What it does to the Otter is anyone’s guess. Too much rain throughout the watershed will cause a serious rise and could render it unfishable for a bit. But, lets wait and see what happens. If you plan to get out during the first part of this week, keep some stonefly nymph patterns handy, as well as worms and princes. For many of us, the Prince is one of the flies on our rig throughout the fall. It is a pretty decent imitation of the Isonychia mayfly nymph. I’ll also keep some caddis patterns handy, both nymph and dry as well as some ISO dries. As we get cooler, the Blue Winged Olive mayfly should get blasting on the creek, especially on cloudy drizzly days. Despite being small, 16-20, they are plentiful and the Creek fish take notice. Regardless of what’s hatching, I do see more fish rising on the creek in the fall. Having some good floating dries, with an emerger behind it or a big/small double dry combo should also be part of your kit this time of year. The cooler weather will also keep the pike fishing going, which has been picking up of late. I know everyone has their preference on color for Pike flies, but I saw a good friend a few years back absolutely crush fish while on a float with orange and white flies. It’s also standard to go big as far as fly size goes this time of year. It takes a big rod for that, but normal sized pike flies will also work. Again, it’s all what you as the angler feel comfortable with. As I was driving around Friday morning checking water temps, I came across a local parking area that has been closed. The big Munger Street pull off on the New Haven has been replaced with grass and a guard-rail. It looks like some folks have been parking further upstream, but remember this is probably someone property and might not take kindly to more pull offs being made. It’s a bummer as this was a popular spot for anglers and swimmers. When in doubt, ask the landowner for permission. The same goes for other areas around. 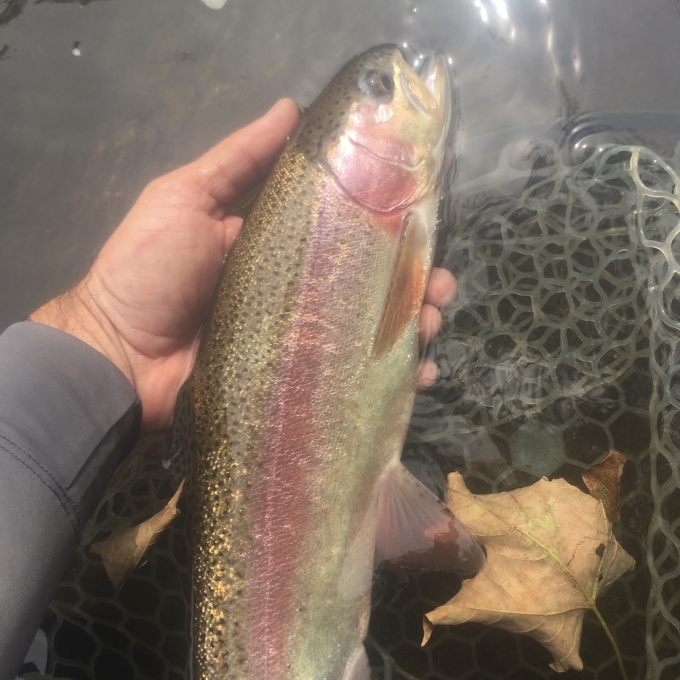 The owners at Dog Team are kind enough to let anglers fish in their back yard, so lets do our part and keep to the stream banks and pack out what we pack in.